Rather than an end-of-year summary or forecasting 2015, this year we have decided to pick a dozen interesting cruises for 2015, one for each month of the year. In each case, they are different from the norm, and none of them are repetitive. We hope you enjoy our choice for 2015. Fred. Olsen Cruise Line offers a special 32-night departure from Dubai to Tokyo on the 43,537-ton 1,747-berth flagship Balmoral, leaving Dubai on January 28. Special last-minute fares are still available for this winter cruise, calling at Mumbai, Cochin, Galle, Port Blair, overnight at Rangoon, Kuala Lumpur, Semarang, Komodo, Ujung Pandang, Cebu, Naha and Tokyo. Pre-cruise stays are available at Dubai and post-cruise hotels at Tokyo. Once trading as Orient Lines’ Crown Odyssey, this ship is returning to familiar waters. February sees a 27-night Cruiseco package using river craft, rail, road and air to travel from Mumbai on India’s west coast to Kolkata on its east coast. The cruise vessel chosen is Colorado-based Haimark Travel’s 185-foot 56-berth Ganges Voyager, with the program including calls at Matiara, Kalna, Kolkata, Mumbai, Udaipur, Jodphur, Jaipur, Ranthambore, Agra, Delhi, Varanasi, Patna, Munger and Murshidabad. In addition to the 10-night luxury cruise, 17 nights are spent in five-star hotels such as the Taj Gateway in Varanasi, Imperial in Delhi, Amarvilas in Agra, Rambagh Palace in Jaipur, Umaid Bhawan Palace in Jodhpur, Taj Lake Palace in Udaipur and the Taj Mahal Palace in Mumbai. Other charterers of this vessel include APT Cruising and Vantage, while sister vessel Ganges Voyager II will be chartered by Uniworld River Cruises. March sees Cruise & Maritime Voyages’ 20,606-ton 590-berth Astor departing Fremantle on the 16th for Tilbury via the Cape of Good Hope on a 38-night liner voyage that calls as Mauritius, Reunion, Durban, Mossel Bay, Cape Town, Walvis Bay, St Helena, Ascension, Casablanca and Lisbon. There is a special offer available in the UK that allows passengers to fly out to join ship for just £299. As all the originally scheduled West African ports have been eliminated because of the Ebola outbreak, she will arrive eight days early at Tilbury, so the opportunity has been taken of offering an 8-night Round Britain cruise from Tilbury on April 23. On the occasion of its 30th anniversary of passenger sailings, Aranui Cruises has announced it will celebrate with a special sailing on April 25, 2015. For thirty years Aranui has been offering travellers the adventure of a lifetime across three French Polynesian archipelagos – the Marquesas, the Tuamotus and the Society Islands, with transport, meals, accommodation and all tours included. In 1960, the Wong family began offering a cargo service and in the early 1980’s modified its freighter with the introduction of a dozen cabins, a new galley, dining room, dormitory and other amenities. 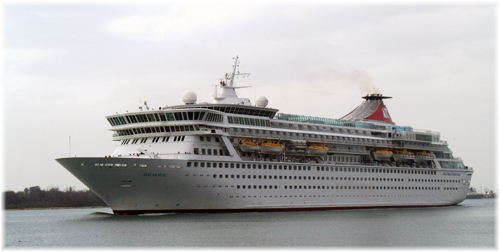 Three ships and thirty years later, Aranui Cruises’ vessels have carried over 44,750 passengers to the islands. Today, the Aranui 3 14-day voyage departs from Papeete, visiting Nuku Hiva, Ua Pou, Tahuata, Fatu Hiva, Hiva Oa, Ua Huka in the Marquesas, Takapoto and Rangiroa in the Tuamotus, and will add a stop at Bora Bora to her itinerary in 2015. 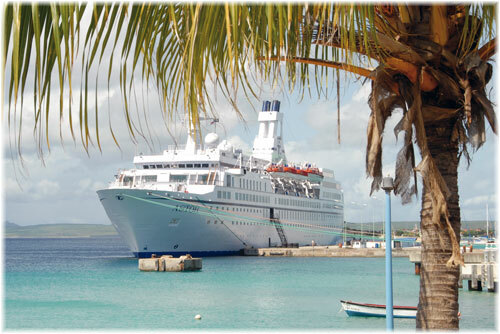 The present ship offers comfortable, air-conditioned accommodations for about 200 passengers. A new ship, Aranui 5, will be introduced in 2015. 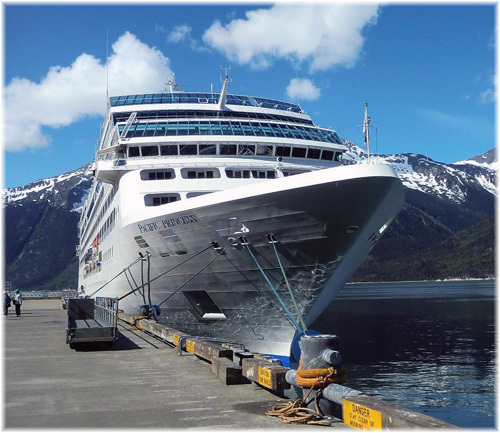 One of Oceania Cruises’ more popular cruises is on board the 66,048-ton 1,250-berth Marina, on May 7, an 11-night spring sailing from New York to Montreal, with gratuities included. The Four-Star-Plus Marina departs from Manhattan and calls at Newport, Boston, Portland, Saint John NB, Halifax, Sydney NS, Saguenay and Quebec before arriving at Montreal on May 17, a perfect time of year for the French-speaking capital of the New World. Then, on May 18, Marina undertakes a 16-night Transatlantic voyage from Montreal to Southampton, with calls at Quebec, Saguenay, Corner Brook, Sydney NS, St Pierre, St John’s NF, Belfast, Dublin, Holyhead and Guernsey. Hapag-Lloyd Cruises celebrated flagship, the 42,830-ton 516-berth Europa 2, top-rated by the Berlitz Guide to Cruising, offers a special 7-night cruise celebrating Andalusia’s bustling hotspots, leaving Lisbon on June 27 and making her way to Barcelona by way of Cadiz, Malaga, Ibiza, Majorca and Menorca. She then remains in the Mediterranean for the summer, offering as number of 7-night itineraries for the younger ultra-luxury crowd that are still working. Special drinks packages are available for UK and International passengers. Summer specials are available with savings of up to 30% if booked before the end of February. On July 4, Cunard Line’s 148,528-ton 2,620-berth Queen Mary 2 sails from Liverpool, remembering the first Transatlantic crossing of the 1,154-ton Britannia from Liverpool to Halifax, which she made in 12 and a half days, and on to Boston. New York was not added until 1847, but Queen Mary 2 will proceed there after Boston on this year’s voyage. The July 4 departure will mark 175 years to the day since Britannia’s 1840 maiden Transatlantic voyage under the then-new mail contract. And for the first time in over fifty years, passengers will be able to board a Cunard ship in Cunard’s original home port and sail for the United States. Cunard’s first Atlantic sailing actually took place on May 16, 1840, when the 648-ton Unicorn left Liverpool with 51 passengers, six weeks ahead of Britannia. The Unicorn was intended to carry passengers and mail on a feeder service between Nova Scotia and Quebec in connection with the Atlantic ships. The newly-launched Haimark Line will introduce the 4,954-ton 210-berth Saint Laurent into service in Eastern Canada, New England and the Great Lakes in 2015. Available for sale now is a special 9-night Great Lakes cruise leaving Chicago on August 28 and including Mackinac Island, an excursion into Lake Superior, Georgian Bay and the Ojibwé Indians, the Henry Ford Museum, Niagara Falls, the Thousand Islands and the St Lawrence Seaway, and finishing in Montreal. 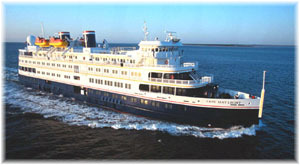 The Saint Laurent previously cruised the Great Lakes in 2001 as Cape May Light. The newly-formed Haimark Line will use the same ship to offer half a dozen cruises between Montreal and Portland, Maine. Ten more cruises will be offered on the French market by Rivages du Monde, with flights from Paris, sailing from Montreal to Toronto, Niagara Falls, the Thousand Islands, Quebec and back to Montreal. September sees Cruise & Maritime Voyages’ 22,080-ton 848-berth Marco Polo departing Tilbury on her 50th Anniversary voyage to Montreal. Fifty years ago, as the Alexandr Pushkin, she first crossed from St Petersburg (then called Leningrad), Helsinki, Copenhagen and Tilbury to Quebec and Montreal for the Baltic Shipping Company. This epic 34-night voyage remembers Marco Polo’s Transatlantic service during her Golden Anniversary year, with calls at Amsterdam and Cherbourg before crossing the Atlantic to St John’s NF. Twenty days will be spent discovering her old cruising grounds in Eastern Canada, including Newfoundland, Nova Scotia, Prince Edward Island, and two days each in Quebec and Montreal as she cruises the mighty St Lawrence River. New calls since she cruised as Alexandr Pushkin will include Sept-Iles, Havre St Pierre and the Magdalen Islands. Then it’s back across the Atlantic with a final call at Cobh before returning to Tilbury. 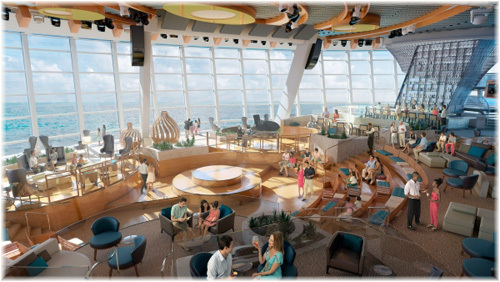 October will see the 168,666-ton 4,180-berth Anthem of the Seas (some 14% larger than Queen Mary 2) make her maiden Transatlantic voyage when, at the end of her first season sailing Mediterranean cruises from Southampton, she departs on a 7-night Atlantic crossing to New York. From New York, Anthem of the Seas will offer a winter program of Caribbean Cruises from Cape Liberty, on the New Jersey side of the port, before presumably returning to the UK for a second season of Mediterranean cruises in 2016. Sister ship Quantum of the Seas will be based in Shanghai from next Spring. Celebrity Cruises’ UK-based 121,878-ton 2,850-berth Celebrity Eclipse does her next Transatlantic voyage on November 1, departing her summer home port of Southampton for Miami, with calls en route at Boston, New York, Bermuda and Port Canaveral. Once in Miami, she will commence an autumn and winter Caribbean season, with varying durations from five nights (Miami-Nassau-Grand Cayman) to 14 nights (Miami-Southern Caribbean). She crosses the Atlantic again on April 17, 2016, heading back to Southampton via Bermuda and Lisbon. To celebrate its 50th anniversary next year, Princess Cruises has scheduled the 30,277-ton 680-berth Pacific Princess for a special Mexican Riviera itinerary departing Los Angeles on December 3, 2015. She will leave fifty years to the day after the line’s original ship, the 6,062-ton 347-berth Princess Patricia, left on her first cruise in 1965. This vessel, from which Princess Cruises took its name, was chartered from Canadian Pacific, who normally operated her in the Alaska cruise trade by summer and laid her up each winter. Pacific Princess is the smallest ship in the Princess fleet, and her 14-night cruise will be of the same duration as that first cruise on the Princess Patricia. It will blend ports from the maiden itinerary, including Puerto Vallarta, Mazatlan and Manzanillo, with newer destinations such as La Paz and Loreto. Princess Cruises’ first season offered ten cruises to Mexico between December and April, accommodating about 3,200 cruisers. Nearly fifty years later, Princess has seventeen ships and now carrying 1.7 million cruisers. * The Cruise Examiner wishes a Happy New Year and prosperous 2015 to all its readers!